USES: This medication is used alone or with other medications (e.g., levodopa) to treat Parkinson's disease. It can improve your ability to move and decrease shakiness (tremor), stiffness, slowed movement, and unsteadiness. It may also decrease the number of episodes of not being able to move ("on-off syndrome"). Bromocriptine is also used to treat hormonal problems caused by high levels of a certain chemical made by the body (prolactin). Such problems include unwanted breast milk, missed/stopped periods, difficulty becoming pregnant, decreased sperm production, and decreased sexual ability. Because of possible serious side effects (e.g., high blood pressure, seizure, heart attack, stroke), bromocriptine is not recommended for stopping unwanted breast milk after pregnancy, miscarriage, or abortion. This medication is also used alone or with other treatments to lower high growth hormone levels (acromegaly). 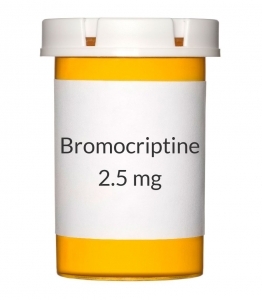 Bromocriptine is also used to treat prolactin-secreting tumors. It may be used to reduce the tumor size before surgery or to control symptoms until other treatments start working. Bromocriptine is an ergot medication that works by helping to restore the balance of a certain natural substance (dopamine) in the brain. It also prevents the release of certain hormones (growth hormone, prolactin). Bromocriptine can lower these hormone levels, but it does not cure the causes of the increased levels. HOW TO USE: Take this medication by mouth with food, usually 1-2 times a day or as directed by your doctor. Your doctor may start your treatment at a lower dose and gradually increase it to find the best dose for you. This medication often causes dizziness, especially just after the first dose. Lie down immediately after taking your first dose to reduce the risk of injury from falling. The dosage is based on your medical condition, the condition being treated, and your response to therapy. Take this medication regularly in order to get the most benefit from it. To help you remember, take it at the same time(s) each day. For Parkinson's disease, your doctor will adjust your dose based on your symptoms and side effects. Your doctor may direct you to lower your levodopa dose after you start this medication. Do not change or stop your medication without talking with your doctor first. For high prolactin levels, it may take 6-8 weeks for the effects of high prolactin to decrease. It may take up to 12 months before you get the full benefit of this medication. For acromegaly, your doctor will monitor your growth hormone levels and adjust the dose. Do not stop taking this medication without your doctor's approval. If you suddenly stop taking this drug, withdrawal reactions may occur. Such reactions can include fever, muscle stiffness, and confusion. Report any such reactions to your doctor immediately. When stopping extended, regular treatment with this drug, gradually reducing the dosage as directed will help prevent withdrawal reactions. Consult your doctor or pharmacist for more details. Tell your doctor if your symptoms do not improve or if they worsen. SIDE EFFECTS: Nausea, constipation, dizziness, drowsiness, loss of appetite, vomiting, diarrhea, and headache may occur. If any of these effects persist or worsen, tell your doctor promptly. Remember that your doctor has prescribed this medication because he or she has judged that the benefit to you is greater than the risk of side effects. Many people using this medication do not have serious side effects. Some people taking bromocriptine have reported falling asleep suddenly during their usual daily activities (e.g., talking on the phone, driving). In some cases, sleep occurred without any feelings of drowsiness beforehand. Therefore, you should not drive or take part in other possibly dangerous activities until you are certain that this medication will not cause drowsiness or sudden sleep. If you experience increased sleepiness or fall asleep during the day, do not drive or take part in other possibly dangerous activities until you have discussed this effect with your doctor. Your risk is increased with use of alcohol or other medications that can make you drowsy. You may also develop a sudden drop in blood pressure. This effect can cause dizziness, nausea, and fainting. A drop in blood pressure is more likely when you are first starting the medication, when your dose is increased, or when you get up suddenly. To lower your risk, get up slowly from a sitting or lying position. Tell your doctor immediately if any of these unlikely but serious side effects occur: back pain, cold/slightly blue fingers/toes, mental/mood changes (e.g., depression, confusion, hallucinations, restlessness), compulsive urges (such as gambling), trouble sleeping, constant watery discharge from the nose, stomach pain, swelling of the legs/ankles/feet, change in the amount of urine, tingling/numbness of hands/feet. Seek immediate medical attention if any of these rare but very serious side effects occur: difficult/painful breathing, bloody/black/tarry stools, chest pain, fast/irregular/pounding heartbeat, severe or persistent headache, seizure, slurred speech, weakness on one side of the body, vision problems (e.g., decreased/blurred vision), vomit that looks like coffee grounds. A very serious allergic reaction to this drug is rare. However, seek immediate medical attention if you notice any symptoms of a serious allergic reaction, including: rash, itching/swelling (especially of the face/tongue/throat), severe dizziness, trouble breathing. This is not a complete list of possible side effects. If you notice other effects not listed above, contact your doctor or pharmacist. In the US - Call your doctor for medical advice about side effects. You may report side effects to FDA at 1-800-FDA-1088. In Canada - Call your doctor for medical advice about side effects. You may report side effects to Health Canada at 1-866-234-2345. PRECAUTIONS: Before taking bromocriptine, tell your doctor or pharmacist if you are allergic to it; or to other ergot medications (e.g., ergonovine, pergolide); or if you have any other allergies. This product may contain inactive ingredients, which can cause allergic reactions or other problems. Talk to your pharmacist for more details. This medication should not be used if you have certain medical conditions. Before using this medicine, consult your doctor or pharmacist if you have: certain genetic enzyme problems (galactose intolerance, lactase deficiency, glucose-galactose malabsorption), uncontrolled high blood pressure. Before using this medication, tell your doctor or pharmacist your medical history, especially of: blood flow problems (e.g., peripheral vascular disease, Raynaud's disease), low blood pressure, breathing problems (e.g., pulmonary fibrosis), gastrointestinal bleeding (e.g., peptic ulcer), heart problems (e.g., coronary artery disease, angina, heart attack, irregular heartbeat), kidney disease, liver disease, mental/mood disorders (e.g., depression, psychosis, schizophrenia, dementia), recent pregnancy (especially with high blood pressure). This drug may make you dizzy or drowsy. Do not drive, use machinery, or do any activity that requires alertness until you are sure you can perform such activities safely. Avoid alcoholic beverages. Bromocriptine can decrease blood circulation in the fingers and toes, especially during exposure to cold, increasing the risk of damage (e.g., frostbite). Keep hands and feet warm during cold weather. During pregnancy, this medication should be used only when clearly needed. This medication can cause a dangerous increase in blood pressure during pregnancy. Discuss the risks and benefits with your doctor. If you are using this medication to make your periods regular and you are sexually active, a pregnancy test is recommended at least once every 4 weeks. Once your period has restarted, pregnancy tests are recommended every time you miss a period. Discuss non-hormonal birth control methods (e.g., condom, diaphragm) with your doctor. If you become pregnant or think you may be pregnant, tell your doctor immediately. This drug may affect breast milk production. Therefore, breast-feeding is not recommended while using this drug. Consult your doctor before breast-feeding. DRUG INTERACTIONS: Drug interactions may change how your medications work or increase your risk for serious side effects. This document does not contain all possible drug interactions. Keep a list of all the products you use (including prescription/nonprescription drugs and herbal products) and share it with your doctor and pharmacist. Do not start, stop, or change the dosage of any medicines without your doctor's approval. Some products that may interact with this drug include: medications for high blood pressure (e.g., methyldopa, reserpine, beta blockers such as metoprolol/propranolol), antipsychotic medication (e.g., haloperidol, pimozide), ergot alkaloids (e.g., ergonovine), metoclopramide, nitrates (e.g., nitroglycerin), octreotide, "triptans" (e.g., sumatriptan, frovatriptan), drugs affecting liver enzymes that remove bromocriptine from your body (such as cimetidine, delavirdine, efavirenz, nefazodone, telithromycin, azole antifungals including ketoconazole, macrolide antibiotics including erythromycin, HIV protease inhibitors such as lopinavir/ritonavir, rifamycins including rifabutin, St. John's wort, certain anti-seizure medicines including carbamazepine). Tell your doctor or pharmacist if you also take drugs that cause drowsiness such as: certain antihistamines (e.g., diphenhydramine), anti-seizure drugs (e.g., phenytoin), medicine for sleep or anxiety (e.g., alprazolam, diazepam, zolpidem), muscle relaxants, narcotic pain relievers (e.g., codeine), psychiatric medicines (e.g., chlorpromazine, risperidone, nortriptyline, trazodone). Check the labels on all your medicines (e.g., cough-and-cold products) because they may contain drowsiness-causing ingredients. Ask your pharmacist about using those products safely. NOTES: Do not share this medication with others. Laboratory and/or medical tests (e.g., blood pressure, complete blood count, eye exams, kidney/liver function tests) should be performed periodically to monitor your progress or check for side effects. Consult your doctor for more details. People with Parkinson's disease may have an increased risk for developing skin cancer (melanoma). If you are taking this drug to treat Parkinson's disease, tell your doctor promptly if you notice a change in the appearance or size of moles or other unusual skin changes. Ask your doctor if you should have regular skin exams.